Some of these comments are white noise. People are worried about this and worried about that. Will there be enough Rangers? As if that isn't a concern for pretty much every other area of the ADK's. Seriously, go enjoy the forest. If any of these theoretical issues become a reality, then let's start discussing ways to address them. But for the time being there is no reason for all this pessimism. Unless of course it's just a way for certain people to pout and vent because they didn't get exactly what they wanted out of the APA's classification plan...in which case I suppose there is a reason for this pessimism, but it isn't a good one. When I was there last summer in July , mid week, I saw 14 people, including 3 smallish children. 2 wheeled in plastic kayaks, 2 pack boats, the others were just day hiking in. I was the only one camping over night. 14 (15 including me) mid week with a 3 1/2 mile hike each way is pretty active I'd say, with the road to within 1/10th mile it could be a traffic jam on the weekends. And helping the economy of Newcomb, I don't know about that. On the plus side it will give great access to the south side of the high peaks and potentially take a lot of pleasure off the northern entry points, which is in the news a lot lately. It's a beautiful area, I'd like to see it stay just as it is now as far as entry is concerned, but not altogether opposed to easier access. Glad I got in early though, may not go back after new regulations take effect so I can remember it in it's more natural state. Leave that place alone for 50 years and it would bea top shelf destination. But then governments are incapable of thinking long term. From the get-go I was pretty sure that motorized access would win out. As for injecting money into Newcomb's economy it's a long way to go from Boreas to Newcomb to pick up big ticket items like more beer and chips when those wilderness staples invariably run out. Here and there I have read comments regarding the Boreas Ponds "entrance" to the High Peaks and how motorized access to Boreas will relieve pressure from the current access points to the High Peaks. I can't see why anybody who was working on their 46 would choose to park at Boreas to access the peaks that are typically accessed from Upper Works. I just measured the distance from La Bier Flow to the south end of Flowed Lands at approx. 11 miles. There is no trail going to Flowed Lands from Boreas Ponds at this time so cutting of a new trail between Allen and Cheney would be required. My guess would be from White Lily Pond to the Hanging Spears Trail. It's a nice view from Boreas but the extra 5 miles, as compared to Upper Works, each way, just to Flowed Lands is a non-starter IMO. Allen OTOH might become a lot more fun (and easier) to hike than it is currently. As for a trail up Cheney Cobble my initial reaction was "Oh no! Another of the Lower 54 tamed!" The odds of such a trail ever actually being cut are probably closer to 0.0 than 1.0 anyway. Not saying I buy the arguments from either side regarding HP access, but one has to also realize that many aspiring 46ers never become 46ers and a lot of people never even aspire to be 46ers who visit this area. Thus it perhaps may become an option for spreading the crowd so to speak, as some may choose something other than climbing Cascade and Porter; like paddling some ponds. The bike trail proposal is interesting (and interesting it was mentioned before the plan was released, it's almost like some people have DEC ESP), but I'm not holding my breath until I actually see it happen. I'd bet if they got some BETA volunteers involved, it would, but I'm not sure that's their plan. They may intend on paying professional builders. As far as the natural character, we have to remember, this place is kind of like Duck Hole or Marcy Dam... it's not natural, it's man-made. If we really intended it to be wilderness we would let the dam go like those places, but as we all know, many were sad to see those go. And it seems like a big motivator from the get-go was preserving those "ponds". Other than a good view, it's really not all that special. There are many other natural ponds than need far more protection than these do, but these new land acquisitions always get the attention. I too hope it won't be too overrun, but it definitely has the potential to turn into a place like Cedar River Flow (or God forbid, Hogtown/Shelving Rock) with both car and boat camping. I have no issue with that as long the DEC keeps a patrol to keep rowdy camping to a minimum. An AFR over the summer should be sufficient I would think and most of the rowdiness would likely be contained to the road sites. Hi Montcalm ... have you run into issues at Cedar River Flow? We've paddled there many times & despite there being several cars in the "parking area", we usually don't see more than one or two other canoes/kayaks out on the flow. Of course those are day paddles so maybe there's a night time issue/concern with occasional rowdy campers? What remains to be seen is whether opening up Boreas will deviate visitation away from the HP's or whether it will increase visitation overall to the park. Maybe it will be a bit of both. ... have you run into issues at Cedar River Flow? We've paddled there many times & despite there being several cars in the "parking area", we usually don't see more than one or two other canoes/kayaks out on the flow. Of course those are day paddles so maybe there's a night time issue/concern with occasional rowdy campers? I've paddled & camped at CRF many times too - usually nice & quiet out on the flow away from the dam & upriver except for 1 time when someone was using a chainsaw in 1 of the backcountry campsites. The easily accessible car-camping campsites at Wakely Dam are another story - seems to attract an element that would rather listen to themselves or recorded music than the loons. I like roadside sites as well - I use them quite often but sometimes there are a-holes who like those too... the best ones I've stayed at were visited regularly by a ranger. I was back at this campsite again today and everything but the 'COOKIES" were cleaned up. I ran into the FR on my way out and he had a DEC work crew come in and clean it up. It's a shame that DEC has to waste their time cleaning up after inconsiderate campers but I am glad it is done. Thank you to the FR and work crew. A couple years ago when it was really warm during December I enjoyed an overnight canoe-camping trip to Cedar River Flow. I think it was the week before Christmas 2015, and my dog & I had the whole place to ourselves as far as I could tell. There were a couple vehicles in the launch parking area but never saw anyone else during our two day stay. One thing I always enjoy doing is checking out any open campsite whenever I can. On this particular trip I stopped at I think just about every campsite (legal or not) around the entire “Flow”, as well as up the Cedar River, and including a short hiking side trip over to Carry Pond. I saw lots of cut tree stumps at every campsite that I stopped at (including Icehouse Landing & Carry Pond). At one site (CRF#3 I think) on a point along the southern shore I found a large black bag full of rancid smelling trash along with a gallon of water left behind. Near the shore I picked up a white plastic bag floating in the water & a couple beer cans submerged near the shore. Further up the flow, left side just past midway there is a scenic campsite right along shore. Please check out the stumps at this campsite whenever you get the chance & please tell me what you think. Just around the corner from this campsite there is another makeshift campsite sorta near the shore, it may be hard to find during the summer weeds, but was easy to find in mid December. Here I found 2 more black bags full of trash, which I again put in my canoe to carry out the next day. Oh, and here there were many more cut tree stumps from careless campers. Heading up the Cedar River I found an attractive campsite atop a knoll at a large bend in the river. This campsite also has lots of cut tree stumps, as it is located way out on a point between wetlands along the river, and I imagine gathering dead & downed firewood near there is not so easy. There was also significant amount of trash left behind in the fire pit, because after all...the firepit is often mistaken as a garage can. I don’t want to drag this on any further but you get the point, and needless to say I carried out a lot of trash that weekend, and saw with my own eyes what easy access can do to an otherwise very beautiful & wild area. 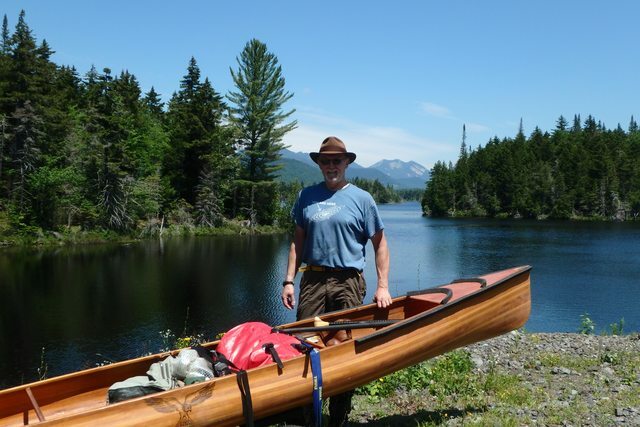 There are other similar places in the Adirondacks that receive similar abuse associated with easy access, and this has been my concern with Boreas Ponds all along, as well as the legitimate threat of invasive species. It would be a huge disappointment if Boreas Ponds turned into something similar to Cedar River Flow and/or Little Tupper Lake. Thankfully motorboats will not be permitted, but that never seems to stop the motorboats from heading upstream on the Cedar River from the Cedar River Flow to the Carry lean-to. Last edited by Justin; 05-23-2018 at 08:57 PM.. I have, more than once. No ranger presence to speak of means parties, loud music and idiots on the water and yelling at all hours of the night. Only about 25 people showed up at the Albany hearing May 23, 13 spoke. Did anyone go to the Newcomb one? They have scheduled 1 more in Lake Placid. Lake Placid Conference Center on June 21, starting at 6 p.m. Thank you. I hope to be able to make it. Perhaps you are just trying to be funny or get my goat, but you do realize there are many different disciplines of MTB and what you post there looks to be DH biking like you might see at a ski resort in the summer. What you get for trail riding is entirely different. People also hike in this park and all the trails are considered multi-use. Often times any feature that might be built (jump or the like) is built out of downed trees and deadfall found around the trail to keep it as natural as possible. When it rots away, it is gone and the trail changes. This section of trail has a bit of speed but often the farther you get into the backcountry, the lower the speeds will be, except on descents. And trails that are properly built won't have grades that are too steep to aid drainage and prevent erosion. user fee argument to use when you expect DEC to build your trails. I would remind you that Cedar River Flow, Boreas Ponds, and Lowes Lake are not wilderness water bodies, as they only exist due to man made dams. If you want to truly have wilderness, blow the dams! Also, wilderness does not contain trails, every entry should be made from a different point to prevent formation of the herd paths that destroy the true wilderness character. And when a fire gets going from a lightning strike, why, let it burn, it is wilderness! I carry bags of trash out from everyplace I have been in the Mountains, it has more to do with ignorance than distance. I had to take 12 hour course to get a hunting license, maybe (and this is definite if you read the ranger rescue reports) it is time to require a hikers license with a course, and insurance so the rest of us are not paying to subsidize the ignorant and the pigs. I drive to 1/2 mile of my favorite pond, and have since the state acquired it in the 1960's. I have never had to deal with "empty bait containers and beer cans" in any amount greater than the other trash left by non "fishing and drinking" campers. And I am taking "degradation of the fishing" to mean you don't catch as many because someone else caught them? Lobby for more restrictive regulations and better education, but where a road has been used to access a site for years while TNC had it, don't start playing the wilderness card now, just to keep it more for yourself. Some of us are getting older and more than a mile is a long hike anymore! So here it is in a nutshell, some of us "elites" should have our land our way, the keep the "general public" (who I contend is paying for a lot of this), the "unwashed masses" away from OUR ponds. From reading many of the other posts in the few days since I found this site, it is clear to me that there are no problems in the motorless far back country with overuse, pollution of water sources. littering, or defecating, even in the middle of trails, or any other destructive behaviors, these are just the "general Motorized public" problems that occur where roads reach. What I find odd is how these organizations who want very little seem to gain almost no traction whereas snow machines get some kind of priority or consideration in almost every land designation. Even Wilderness there is always a consideration where the snowmobiles will go. How much do you pay to register your Bike? The Snowmobilers pay something called a "user fee", like a fishing license, or a hunting license, and that gives them a bit of leverage. Isn't working too well for the ATVer's, but they are paying the money, and they are making more noise.